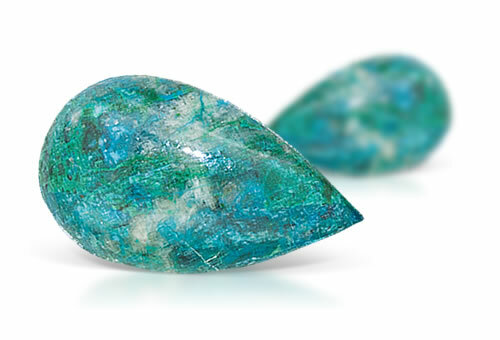 The rich greens of eilat stone comes from it being a unique combination of various copper-bearing minerals including chrysocolla, malachite, azurite and turquoise. This stone is the national stone of Israel and known as King Solomon stone, as it comes from what is storied as King Solomon's mines in the Timna Valley of Israel. National stone of Israel and must come from Israel to be true eilat stone. Mixture of chrysocolla, malachite, pseudomalachite and azurite.If the stone is tested in a chrysocolla area the RI will be 1.50 or 1.61 if tested in a malachite area. The malachite RI can blink from 1.66 to OTL and birefringence of 0.025. Eilat stone has a variegated and mottled appearance.